Airline Flights Can be Terrible For Your Sinus Pain, Prevent It. Flights on an airline tend to conjure feelings of excitement, However, if you suffer from sinus pain flying could be a nightmare. The majority of travelers enjoy airline flights, partly for the excitement involved with the whole experience in the airport, and partly because of the other-worldly feeling of flying above all the cities, towns, and landscape which are literally miles below. Then too, the excitement of traveling to a distant destination, possibly to visit loved ones or friends whom you haven’t seen for years, adds another very powerful appeal to the experience of flying. 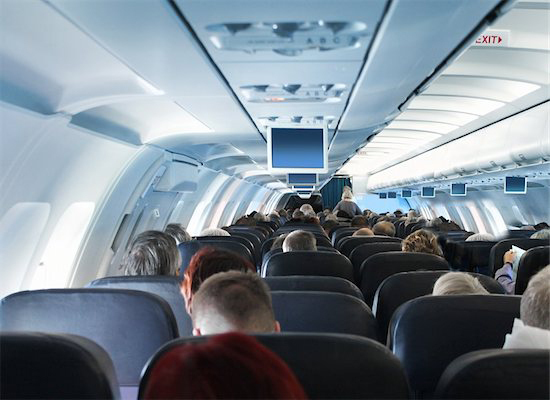 However, there is at least one thing that most people find somewhat annoying regarding airline flights, and that’s the inevitable sensation of having sinus pressure, or the need to clear your ears while in the air. This is especially true during takeoff and landing, where both those sensations are most noticeable. As an airplane takes off and begins to ascend, the pressure in your middle ear and sinus cavities begins to expand. In fact, the air inside your sinus cavities and your middle ear will even evacuate those two areas, flowing out into the cabin of the airplane itself. The exact opposite happens when an airplane is descending, i.e. air pressure in your middle ear and in the sinus cavities becomes much more compressed than it was before. That means there is considerably less air pressure in those two body locations than there is in the cabin of the airplane. This is felt by the body as a kind of squeezing sensation or negative pressure. When the eustachian tube leading to your middle ear is unable to provide new air to the middle ear, it causes air pressure to increase dramatically during the descent. When that happens, fluid builds up in the middle ear, which will be noticed as either a loss of hearing or a kind of fuzzy or dulled hearing capability. This can actually lead to a sinus infection if the condition is not reversed fairly soon. For most people, it never gets to this point, and the air pressure in your middle ear and sinus cavities become stabilized before any real negative effects can occur. However, that doesn’t mean that you won’t feel a little uncomfortable for a certain amount of time and that your hearing won’t be impacted for at least a little while. With a little luck, by the time you’re in the baggage line ready to collect your luggage, you should feel fairly normal again, and your hearing should be right back to the level it was pre-flight. When flying a person with sinus pain can be in a really uncomfortable situation as their sinus cavities would expand and cause pain. There are a number of things you can do to relieve the pressure you experience during an airline flight. While these tips may not be 100% effective, in most cases they will at least reduce the level of pressure you feel, and they will make the ascents and descents of the airplane more tolerable. One of the best things you can do to alleviate changing air pressure as you fly is to take an allergy medicine before traveling. You may already have a prescription for an allergy medication from your doctor, or you may need to simply purchase one over-the-counter, but in any case, these can effectively reduce any pressure sensations you feel during the flight. If you don’t suffer from allergies and you’ve never used allergy medications, an oral decongestant can be just as effective in many cases, and this is something you should also do before the flight. As you’re waiting in the airline terminal, prior to the time your plane begins boarding, just pop in an oral decongestant with a glass of water, and you just might get through the whole flight without any discomfort. If your flight is a long one, you may need to supplement the original ingestion of either allergy medication or oral decongestant by taking a second capsule with a beverage at some point before the descent begins. Sometimes topical nasal decongestants can also be effective, and if you’re using one of these, it should be applied approximately 30 minutes before the plane ascends or descends, in order for it to take effect. For many people, taking a drink of water during the plane’s ascent or descent will relieve the pressure felt in sinus cavities or in the middle ear. Chewing gum at those same times is another tactic which is extremely effective for many people, so before your airline flight, it might be a good idea to stop at a newsstand and purchase one or two packages of chewing gum for the journey. The last recommendation for alleviating pressure felt in the sinus cavities or in the middle ear during airline flights is to perform a self-procedure which can physically accomplish the relief of any pressure which builds up. This procedure is called a Valsalva, and it involves pinching the nose closed while concurrently blowing the nose. This may have to be repeated several times during ascent or descent, in order to achieve maximum effectiveness. Obviously, this might be a bit disconcerting to people who are seated next to you on the flight, and it might be a bit attention-getting in the airplane cabin. However, if you don’t mind calling a little attention to yourself, it can be fairly effective in reducing sinus pressure that you feel. A little social discomfort might be far more preferable to the physical discomfort you would feel if you don’t do anything at all.